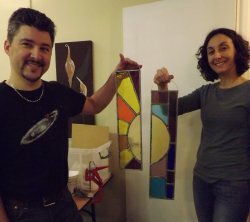 So you’d like to really get in to making stained glass? There’s no question – stained glass can be beautiful to look at and enjoyable to make. The popularity of Vitreus Art’s one-day beginners classes tells us that there are plenty of you out there who fancy having a go. And the fact that our 5-day courses sell out each year suggests that some of you want to develop your skills or work on substantial projects in a learning environment. So what advice would we give to someone aiming to build on basic skills, and what learning progressions are available to the student? We know from our own experience, and from observing how some of our own students have progressed, that there are three areas to think about when discussing this sort of learning process. We often ask our students this – it’s a great way to open any conversation with a student and the range of answers is wide! For example, some are considering getting in to stained glass as a lifestyle business; I guess they’ve seen our fleet of Lamborghinis outside the gallery and correctly guess stained glass is a path to riches! Others seek a stimulating artistic hobby, while others yet have a specific project – replace a window in their home is a common project. The other aspect to this question is – how good do you want to get? Good enough to make that window, good enough to sell work at galleries or craft shows, good enough even, to make a living? It’s eminently possible to have fun making stained glass without some higher purpose, and really – you can get as good as you want. But to get to a standard where you can sell your work – that takes more practice. It’s also necessary to have an understanding of failure modes so that you don’t sell pieces that will fall apart. A common issue of this kind is soldering hanging loops to the foil on the edge of a piece; it won’t be long before the foil comes away from the edge of the glass as there’s only the adhesive on the back of the foil to keep it there, and that ain’t that strong! Better to solder your loops in to a bead (a solder line between two adjoining glass sections). Or for leaded pieces, a long stretch of U came around the edge of a piece with no joining H cames will also come away from the edge of the glass, no matter how well cemented. Again, don’t solder hanging loops to these cames. Solder them to corners, or to H cames where they meet an edge came. And we suggest you use silicone glue to secure that long piece of U came to the edge – like on a mirror, for example. These sorts of tips are often shared in our workshops – we’re always happy to exchange ideas and make suggestions. If your goal is more lofty than just ‘I want to make glass for fun’ then some business acumen is desirable – and if you’d like to make a living creating glasswork then it’s essential, along with marketing, accounting and selling skills. A realistic perspective on how good your work currently is will help in the long run, even if it seems a bit harsh right now. Take a look at the work on sale at good craft shows, watch other artists at work if you can (open studios are a good opportunity for this), and ask questions. How does the design, execution, presentation of the pieces you’re looking at compare with yours? Better? In what ways? Be honest with yourself and don’t be disheartened to discover you’re not there yet – every successful artist and craftsperson had to start as a beginner! Like all artists, Jenny and I made plenty of pieces while we were novices that wouldn’t pass muster. Even now, sometimes a piece doesn’t work out well enough to sell, but luckily that’s rare or we’d go out of business! And this follows on to the next element – getting good enough to sell your work if that’s what you want to do, or good enough to make a window that doesn’t let in the rain! We’ve been watching the rise of the distance-learning programme for art and craft subjects for some years now. 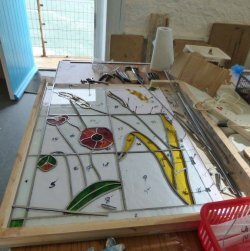 Indeed, we’ve often thought about setting up our own online course – a structured system with pre-designed projects, each designed to help the student work on a particular aspect of stained glass. Maybe we’ll actually run a course like this one day! For now, though, there are a few questions we don’t have answers to. How does the student get real-time feedback on their progress, or on their techniques? I guess the student could send photos of work in progress and finished pieces or share in a closed group, but that just doesn’t seem to provide the degree (and kind) of feedback we like our students to have. We really enjoy sitting with a student, talking through what they’re doing, showing, demonstrating, observing and providing constructive feedback. We also enjoy having our own work on display in our gallery – we can use pieces as examples of design features, setting a standard of execution, and, we hope, inspiring students on their journey. We find that it’s so much more effective to give feedback and guidance as the student is working – this is giving feedback the student can use right there and then, rather than after a piece is finished and before the next one is started. We’ve found, for example, that being able to watch a student position their glass cutter as they prepare to make a score allows us to help them adjust the angle, pressure and placement right there. I don’t know how we would work on that vital skill at a distance! I could give dozens of examples of this kind of ‘up close and personal’ teaching but I’m sure you get the idea. As students progress, and especially as they get really confident, or practice at home, we still offer a critique of their finished work at any time – and are always available to talk about displaying or mounting or framing their work too. Both Jenny and I get a buzz from seeing work produced independently by students past and present. And we take pride in the amazing pieces many of them have created – often using styles and techniques and materials we haven’t tried ourselves! Yes – design your own projects. They don’t have to be complex, or massive. They don’t have to follow a style, or an art era’s visual language, they just need to be yours, like this lovely window, made by Sally on a recent course with us in Porthleven. There are (literally) millions of projects to find on the internet, many made available free of charge by generous creators. These offer a great opportunity to develop the mechanical skills required for stained glass in your own time but before long you’ll want to make your own designs. You’ll have to learn about cuts that are impossible or at least very hard to accomplish in glass, you’ll learn about design weaknesses resulting from lead or foil lines that cross the whole piece. You’ll have to learn about balance, colour, manipulating space and creating flow. You could start with a main design element – like a rose or tree, or sun – and build a design around this – one way to design from scratch. Study existing designs – why do the cut lines go where they do, how are the spaces and shapes balanced, do the proportions please the eye? Read up on golden ratios, learn how to draw circles, and find the centres of those circles (use the ‘box’ method – Google is your friend here), and get a book or two on the subject. And one further recommendation – learn to make those tricky scores work. Practice cutting deeper and deeper concaves, learn to cut circles accurately; this way your designs won’t have to be limited by your mechanical skills. We often encounter novices who’ve avoided having to learn these skills by only making pieces with straight lines. Feel the fear and do it anyway! If you lack confidence at first, use a flexi curve and a French curve, or circle stencils to develop abstract designs to make and thereby hone your skills. Some of the best stained glass we’ve seen was conceived this way. If it looks good and you enjoyed making it, nobody needs to know how you designed it in the first place! Learning progressions with teachers – where Vitreus Art comes in! We love what we do, and we want to help others get enjoyment from making stained glass. This is the ethos behind out programme of classes and courses – take you from beginner to whatever level you aspire to reaching. You won’t be surprised that we suggest a beginner’s class to start with. 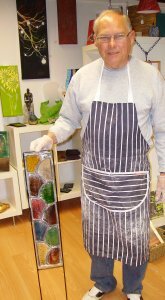 In most counties you’ll find stained glass makers who offer classes – some off classes as an occasional adjunct to their main business while others (like Vitreus Art) run programmes of classes as an integral part of their operation. At the risk of appearing to sell you two classes where one might suffice, we usually recommend trying both traditional leading stained glass and then sampling the more modern ‘Tiffany’ or foiling method. Unless you only intend to make foiled pieces we feel having at least a little competence in both methods hugely broadens the range of projects you can take on, as well as growing your appreciation of the history of stained glass, giving you more confidence in your abilities and aiding your understanding of the design constraints of stained glass. If you’re feeling confident in your abilities you can hire a space to work in and the tools you’ll need by the day – as many days as you need to finish your project. These sessions are un-tutored but of course one of us will always be on hand to offer guidance or encouragement. You can buy your own materials or use ours, charged at cost. Many of our students have made some fantastic work in this way and we like that way our gallery feels when students are working here! If you’d like to combine working on your own design with a full workshop level of tuition, and with all the glass you’ll need provided, we offer weekend project workshops twice a year (and at other times by arrangement). We set a maximum size for your project in these courses to ensure you can achieve your aims without too much pressure! We’re flexible about the kind of project you choose to work on during our weekend workshop but we do ask that you’ll have done at least a beginner’s class in the method you’ll be using for your piece. We’re always happy to talk through your plans before you book to make sure you’re getting the best value from your course place. And then we have our legendary 5 day courses – held in Porthleven, Cornwall and at our gallery-studio in Northamptonshire, near Milton Keynes. Open to beginners and those with all levels of experience, these course give you the scope to tackle some really adventurous projects, or make a number of smaller pieces to develop a whole range of skills in one week. 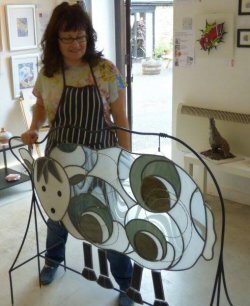 On recent courses students have made projects ranging from highly complex mandala designs, to kaleidoscopes, to prairie-style 4-sided or 6-sided lamps, garden sculptures, windows of many shapes and sizes through to a life-size stained glass sheep to be displayed in the student’s garden! As with our weekend project workshops, our 5-day courses are fully tutored – and with a student to tutor ratio of 1:4 at the most there’s the scope for a really intensive learning experience. 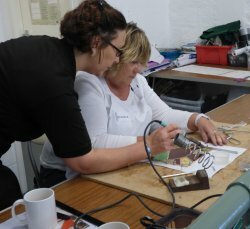 Our course in Porthleven can be equally thought of as a artistic retreat, a creative holiday and a stained glass course! And back at our studio, our October 5-day course gives us the scope to host smaller class sizes for even more personal attention, usually for the most sophisticated projects. As with our other courses, we’ll work with you on your design in advance – to make sure it’s achievable and will withstand transport, hanging or mounting. 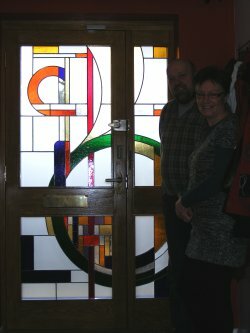 The final option for budding stained glass artists is to work with us to develop a programme of learning focused on achieving exactly what you want to achieve – which may involve exercises to develop skills, joint projects where we work with you on your project (like the 4 door windows below) or a weekly or monthly series of projects to test particular aspects of the art (and craft) or stained glass. So there we have it – if you want to get in to stained glass – for a hobby, to make a project with sentimental significance, for your home, or even to sell, get in touch and we’ll help you get started on your journey! How is art like a good cigar? Why is (original) art like a good cigar? Firstly – choosing art needs time and attention – you don’t want to commit yourself to a piece of art that offered an initial flash of excitement, but later comes to annoy, or disappoint. A cigar is the same – a few hasty puffs may leave you light-headed. Much better to set aside some time for contemplation. Artists – if you can give your prospective clients the opportunity to ‘test drive’ a piece or two in their own homes, you stand a better chance of making the sale and developing a longer-term relationship with that customer. Just make sure you know where the piece is going, and get an agreement that the customer takes on the risk of damage while in their custody! Secondly – no two ‘real’ cigars are the same. They’re hand-made (not supermarket cigars obviously). Variations in taste, draw, burning time, and consistency during the smoke are surprisingly wide between examples of the same cigar from the same box. It’s the same with art – artists don’t always produce work to their best standard, and what you see in a studio or gallery on one day may represent the best they’ve created or not. If you like the style, seek the artist out and see what else they have to offer! Artists – turn your stock at galleries over from time to time, and make sure you can be found on the internet! And consider if the work you’re presenting is the best you’ve done. Next – cut your cloth according to your means. 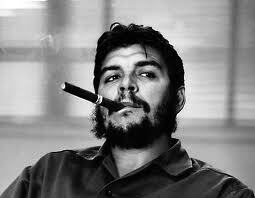 I’m fond of the Montecristo No.4 – the choice of Che Guevara and other revolutionaries. But it’s not cheap, and takes nearly an hour to enjoy. Often I don’t have the time, so I’ll ‘compromise’ on a No. 5 – shorter, less expensive, quicker to smoke and less ostentatious. With art, be realistic about the space you have for a piece, and the environment it will live in. If you have a small space, or a small budget – get the best you can to fit within. Artists – if you can offer work at a range of price points you might be able to win a customer who will buy larger or higher-priced work from you later. A good reason to stay in touch, via mail, email, regular open studios or open evenings – these have all worked for me or artists I know. Those seeking out exciting art are likely to do their research, and will enjoy finding out how pieces came in to being. The more info an artist provides about their work, and the more they ‘augment’ the story about the pieces they make, the more enthusiastic the eventual buyers are likely to be. Running demo days, being able to talk about their skills at Open Studios, using video to show what they do, creating rich experiences on their websites – these all help to build an exciting and informative picture for the customer. I’ve seen how this can work, and aim to do so with my and Jenny’s stained glass work. I’m off to devote a little time to artistic contemplation. And a nice cigar. Let me know if I’ve missed any other parallels between art and cigars! You know how sometimes you wish you’d started using something a long while ago because it’s just so brilliant? That’s the position I’m in with Flickr. I’ve been recommending Flickr to artists who didn’t feel the need for a website of their own, or who couldn’t afford one (although ‘free’ websites are readily available now). Because we’ve had our own website from the start we’ve put off developing a presence on Flickr, but now we have, boy do we wish we’d done it before! We’re using it to publish photos of students on our stained glass classes. Of course we’ve been taking photos of class attendees working, and the pieces they make, since we started teaching about 3 years ago. But we’ve lacked that simple way to make them available without selecting and emailing them. Instead, any of our students can choose to copy the images that feature them or their work and save them. Why didn’t we do that before?! Have a look at our Flickr stream and let me know what you think. And of course, we want other folks to be able to see what we do – after all, we’re looking to drive traffic to our website and grow our visitors and business. So we’ve added folders of stained glass pieces we’ve made as commissions, and a selection of glass art from our archives too. What a great way to get your artwork in front of a larger audience – I’m sold! To all artists capable of photographing their work – Flickr is a brilliant marketing opportunity for you – it just needs a bit of thought and planning. If you’re an artist or a craftworker, or an avid user of Flickr, I’d love to hear any other tips you have that others can benefit from! Why do we teach stained glass when we already have enough competition?! By now you know we teach stained glass, right? I go on about it often enough! Well, one of the reasons we teach (aside from wanting to share the craft we’ve become passionate about!) is that we often hear from would-be stained glass artists who’ve gone out and bought tools and glass and materials and then found they just couldn’t make it work. They cut themselves to shreds, their pieces didn’t fit together, they wasted loads of expensive glass, their soldering was lumpy and ugly, or their fledgling abilities just didn’t develop. Net result – most of them gave up. We had the benefit of a day’s class when we were starting. We had no idea what was required, where to begin, what tools were needed – we just knew we wanted to find out if we liked it, and if we might show any early promise! It could have been so different – Lord knows it’s sometimes a frustrating craft! However, decent tuition, access to the right tools, and the desire to learn from someone clearly very skilled set us off in the right direction. Fast-forward 5 years and we’re making commissions, selling through galleries and teaching. Why? Coming from marketing and PR backgrounds, we both felt that we were good communicators, and we’d been on a very steep learning curve. So as we began to field questions from people who wanted to try, or who’d tried and given up, we set up our first class. Crikey – that was hard work! And the investment – we decided that 6 was a good number of students so we needed 6 sets of tools. And you may already know, a complete set of tools costs about £150 per person, not including a grinder. And don’t forget the glass – we get through a lot! We hooked up with a local gallery with spare workshop space (thanks Sally!) and set some dates. Luckily we found enough students (that always seems like the wrong word!) and set off on our journey. We did a lot of planning, a lot of cost analysis to be sure we knew how long and how many classes it would take to repay the investment in tools and glass. And we sweated over the lesson plan and rehearsed, and tested. The comments we had back after our early sessions encouraged us to carry on. We now run 13 or more sessions a year, some at an intermediate level now that we have students who are keen to progress to making bolder and more ambitious pieces. 2009 hasn’t been the best of years for me but I can truly say that this one day was my real highlight. Your passion for the subject really shone through and your professionalism in guiding us in all the task was amazing. I am delighted with the pieces I made. I suspect my husband actually thought I’d bought them! And now that our classes are getting fully booked months in advance, we’ve taken the plunge and set up a 5-day workshop in Cornwall too! We must be mad! one – you might save a lot of money on tools if you don’t enjoy it! two (much more likely!) – starting off with someone to show you the basics and to offer constructive feedback might get you totally hooked, like it did for us! I’d love to find out how you got started, or even what made you give up. We might be able to offer some advice! I’m considering running a tips and tricks column on our stained glass website, or in our monthly newsletters, or on this blog. I’d like to know if this would be useful to you – leave a comment and let me know. Are you teaching, or sharing? A lot of artists teach these days – it’s a good way to boost income, and if you’re good at it, it’s very satisfying. Especially if you take absolute beginners and set them off on a life-changing path towards artistic endeavour. But it occurs to me there are some points to be aware of when considering going into teaching (as we know many of our artist friends are). Firstly, being good at something doesn’t make you good at teaching it. Being able to show students how you paint ain’t the same as helping them do it. Teaching is a skill. We find when teaching our stained glass beginner’s class that it’s vital to step out of the comfortable zone of competency that we enjoy: to imagine holding a glass cutter for the first time, feeling the glass score. And students often are frightened of breaking the glass – will it shatter into a million shards? Will it break, but not according to the design? After a couple of successful breaks most students begin to trust the cutters and their growing confidence in applying enough pressure along the score. And that moment is a pleasure for us too – it means we’ve got through to the nervous learner. And that’s the point where the sharing takes over from the teaching. Our hope is that we’ve shared our passion for the subject, and provided the technical skills for students to set off on the journey, like we did 5 or 6 years ago. Secondly – a good class needs structure and clear objectives. Where do you start, what’s the end point? What can you expect your students to realistically achieve in the time? What can you do to instill the fundamentals and inspire an interest in continuing to develop? We started out be building a class plan, and it still works. We’ve found ways to improve it, but we sat down and worked out what needed to be covered, and when, and what could be left out in the interests of time, or avoiding complexity. This lesson plan is now so ingrained that we rarely refer to it. But the effort of working it out was vital. Thirdly – what is a realistic price to charge? In our case, on top of renting a venue, we had to consider our investment in 6 sets of tools (about £275 per student to begin with, plus ongoing updating and replacements). Over what period do you expect or need to repay this investment? We also use quite a lot of glass for each session as our students go home with a nice piece to show their family and friends. We have to carefully account for the costs here too. And how do you value your time? Our rule of thumb is if we could make a piece each in the same time that we’d charge, say, £500 for, we’d expect to make more than the profit on those pieces as the ‘personal time’ element of the class costs. Are your students coming to you to learn something as a hobby, or as the start of a potential business? The owner of Hertfordshire School of Jewellery (one of our teaching venues) offers intensive sessions for prospective jewellery makers who expect to go into the craft as a business. The structure and costs associated with classes like these is different to ones held for hobbyists. Next, how do you identify where students are having difficulty and divert attention to help? For me this was the hardest aspect of learning how to teach stained glass. We now know most of the signs – slow progress is the most obvious. We look out for this, and step in. Not to do the work ourselves, but to isolate the aspect that’s holding the student up, and work on it. Is it a problem coordinating the meeting of the soldering iron and the solder on the join, for example? In your environment there will be challenges that some students will struggle to overcome. The more you can prepare for these, the easier it will be to get students back on track. Finally – creating a stimulating and fun environment. Most of our students are looking for a fun day, learning something new, away from job, family, or other responsibilities. More and more people are discovering an interest in making things instead of just buying them, and these make up the majority of our students. How do you ensure they have a good time, learn something, and go home happy? We aim to create an informal atmosphere; all the students can see what the others are doing, and pick up tips often. We maintain a level of jolly banter, with support and encouragement, but honest appraisal too. We point out where a little more work, or a slightly different approach will yield a better result. We encourage students to critique their own work. We keep the level light at all times. Above all, we share – our passion, our glasswork experience, and lessons learned about life and business. Many of our students are curious about what it’s like being an artist and we tell them. We also give them an insight into the other skills artists need – business, marketing, publicity, cost-management, how to photograph your own work and so on. This is all part of the sharing package – students go home feeling like they’ve discovered insights beyond the simple mechanical ones related to making stained glass. What can you offer your students beyond helping them to develop their eye, and gaining technical skills and knowledge? I’d like to hear how you teach, or what your concerns are if you’re getting in to it. 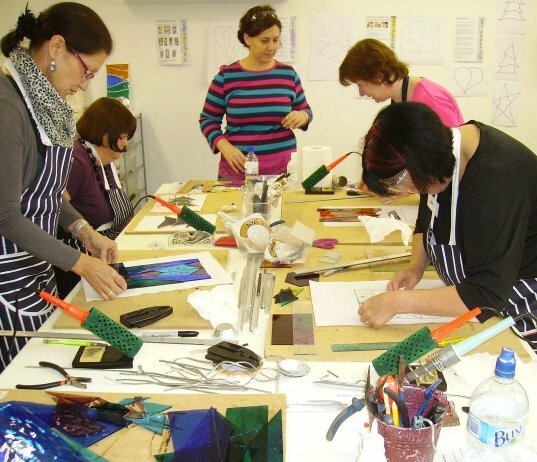 You can see details of the stained glass classes we run as Vitreus Art here.